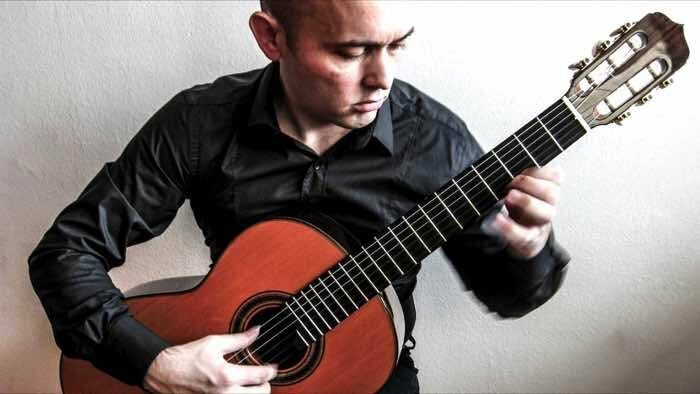 This is Dragan Marinkovic, a guitarist from Bosnia Herzegovina. He is working as a professor in elementary and secondary music school. A couple of years ago he organized a guitar festival in Banja Luka in Bosnia where two of the competitors playing my guitars, won the competition in their categories. Dragan liked their guitars and later he bought one himself. which turned out to be a great recording instrument as well. To underline this he made this beautiful recording of Il Sentimentale opus 148, nr. 4 by Mauro Giuliani. Otto Vowinkel is a household name in the classical guitar world; a renowned luthier with customers all over the world. His instruments are physically light, easy to play, ultra-responsive and very powerful. His guitars have outstanding tonal qualities, evenness in sound colour and a perfect intonation. Otto blogs about making guitars, guitarists who play his instruments, festivals he visits and ‘his’ guitar series Meesters op de Gitaar. He also writes about guitar maintenance.